Home > Uitgevers > BLAM ! 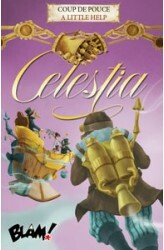 In Celestia, a revamped version of Cloud 9, you board an aircraft with a team of adventurers to perform many trips through the cities of Celestia and recover their wonderful treasures. Your journey will not be safe, but you will attempt to be the richest adventurer by collecting the most precious treasures! At the beginning of a journey, all players place their pawns within the aircraft; the players start the game with six cards in hand (or eight depending on the number of players). At the beginning of each round, one player is chosen to be the captain of the trip and he rolls 2-4 dice to discover the challenges that they will face: fog, lightning bolts, killer birds, or pirates. 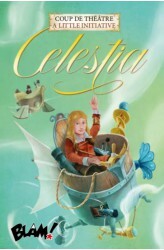 He must then play the appropriate cards — a compass, a lightning arrester, a foghorn, or even cannons — ..
A captain never abandons his ship, but he does sometimes require a helping hand... Celestia: A Little Help allows passengers to give the captain a hand, but bluffing and dirty tricks will still show their hand as well! https://youtu.be/diu9CWEQYWA .. Thanks to the Celestia: A Little Initiative expansion, you can leave the aircraft using the rowboat. With a single space, you'll have to be the quickest to embark, but is traveling alone such a good idea? 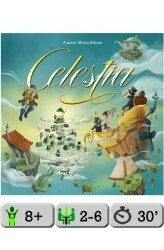 This is the second expansion set for Celestia. It contains a 3D rowboat and new special cards. With this expansion pack you can now play Rowboat cards to continue on your journey alone - victory without risk brings triumph without glory! The Rowboat captain faces the challenges alone. Each vessel (Aircraft and Rowboat) has its own die roll. .. Under a vile curse, the forest is slowly dying. A few druids, last guardians of this green and endangered kingdom, answer the call of the helpless animals. Save the forest and become its protector! 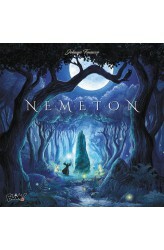 In Nemeton, you have ten moons (ten turns) to explore the forest, create new potions, and summon the spirit of animals to earn as many reputation points as possible. A player's turn has four phases — night, dawn, day, and dusk — then the next player takes their turn. At night, the druid summons the power of the moon to grow sacred plant essences in the forest. The player adds a “Forest” tile to the existing forest on the “Moon” side. Once the tile is placed, the player checks if he can link it in a straight line with another “Forest” tile of the sa.. Through incessant wars for its control, the Lords of Time put the source of immortality at risk. To prevent its drying up and their own demise, they created the Time Arena: a sacred place where they fight, invoking the spirits of warriors from ancient time or from distant galaxies. Those who manage to dominate time and destroy the opponent's Totem gain the right to access the source and thus ensure the lineage of the Lords of Time. 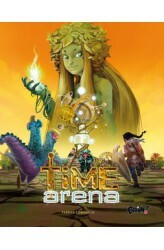 Time Arena is a confrontation game for two players or two teams. You control four fighters, and your aim is to destroy your opponents' Totem — but time is running out, and you have only five minutes… When the timer shows « 0 », you lose the game! In more detail, players take turns performing their team's actions, after which the other player's (o..